With over 100,000 artefacts in 107 halls, the Egyptian Museum provides days of exploration. Inside are treasures from ancient Egypt, including priceless finery taken from ancient royal tombs, and one of the museum's masterpieces, the statue of Khafre (Chephren). The most popular attraction is the Tutankhamun Gallery where exquisite treasures from the tomb of the iconic Boy King are displayed, including the famous solid gold death mask. Another top attraction is the Royal Mummy Room containing mummies of some of the most powerful Pharaohs in Egypt dating from the 18th to 20th dynasties (there is an additional cost for this room). 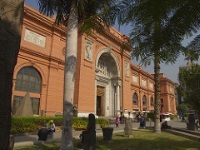 The museum also contains collections of artefacts including coins, papyrus scrolls, scarabs and sarcophagi. There is a cafeteria, bank, post office, gift shop and library at the museum and taped audio guides are available in English, French and Arabic. Visitors should be aware that photography is not allowed. Although a trip to Egypt would feel incomplete without a visit to this incredible museum, its location on Tahrir Square means that foreigners must be cautious visiting during periods of unrest. If there are demonstrations on the square it is best to avoid the area. Admission: General admission for foreigners is EGP 60. Concessions are available.